What Do I Mean When I Say I’m a Fiscal Conservative? Americans are a very fortunate people. We are protected by two oceans and friendly neighbors to our north and south. We are the strongest country in the world, both economically and militarily. We provide the world with cutting edge leadership in many areas such as technology, finance, energy production, scientific research and university education. In short we live in a very successful, prosperous and complex society. We do have serious problems but they are being addressed by our elaborate legal and governmental processes and structures. Slowly but surely life in America is getting better and better all the time. Given our country’s size, complexity and dominance in the world, it is inevitable that government will also grow in size and structure in order to take on new responsibilities. It is completely unrealistic to think that we can return to a more limited form of government that existed in the past. When I say, then, that I’m a fiscal conservative, I am not advocating for less government but merely that we pay for the government that we have, in other words, act in a fiscally responsible manner. Our national debt, now 77% of GDP (for the public debt on which we pay interest), is the highest since right after WWII. It is predicted by the Congressional Budget Office that it will keep steadily getting worse without major changes in current policy. The urgency of the debt problem is based on the fact that interest rates are now so low that it is almost “free” money. But interest rates will inevitably return to more normal historical levels and, when this happens, interest payments on the debt will skyrocket. Eventually this will lead to a Fiscal Crisis, much worse than the Financial Crisis of 2008. The solution to this problem need not be drastic. Federal spending is growing by 5% per year while tax revenues are growing by 3% per year. 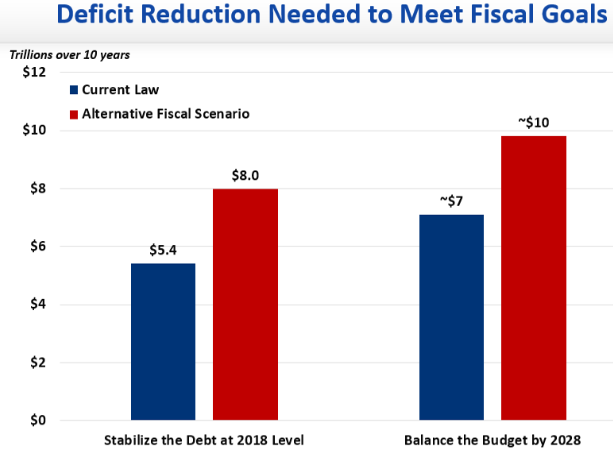 If we would just hold spending increases down to 2.5% per year, the federal budget would be balanced in a few years and our debt would start shrinking as a percentage of GDP. Conclusion. Spending restraint, with very few actual spending cuts, is all that it will take to put our debt problem on a path to solution. Surely we are capable of acting in a fiscally responsible manner like this! Most of the controversy generated by the healthcare bill passed by the House, and the one now being considered by the Senate, concerns the way Medicaid is funded. The current system whereby states are reimbursed by the federal government for a percentage (national average 53%) of their Medicaid expenses would be replaced by putting the federal contribution on a strict per-capita basis, indexed to the annual rate of inflation. Medicaid is a vast program now serving 73 million low-income and disabled Americans and is doing a good job especially for the elderly and the disabled with special needs. But it costs the federal government nearly $400 billion per year and the cost is growing rapidly. It is essential to get open-ended Medicaid spending under much better control and one good way to do this is to put the federal contribution on a fixed budget. 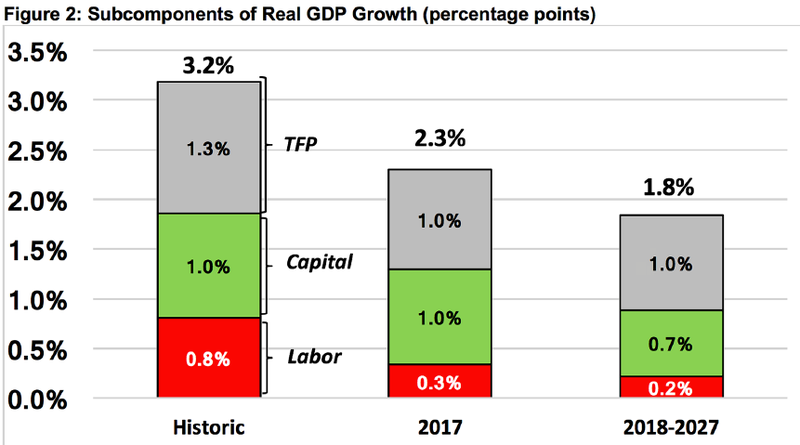 The Congressional Budget Office has just issued its latest Budget and Economic Outlook report. It shows the ever-worsening fiscal condition for the U.S., unless current policy is changed. The deficit for 2017 is predicted to be $693 billion or 3.6% of GDP. Deficits will grow dramatically over the next decade with trillion dollar deficits returning by 2022. Debt held by the public (on which interest is paid) will grow by $11.2 trillion between now and 2027, from $14.3 trillion today. Spending will grow from 20.9 percent of GDP in 2016 to 23.6 percent in 2027, while revenues will rise from 17.8 percent in 2016 to 18.4 percent by 2027. The vast majority of spending growth over the next decade (83%) is the result of rising costs for health care, Social Security, and interest on the debt. Conclusion. The national debt is growing much too fast. The only way to turn this dangerous situation around is to reform all entitlement programs, including Medicaid, to get their costs under much better control. Can the GOP Produce on Healthcare? The House of Representatives, after much struggle, was finally able to pass a healthcare bill, The American Health Care Act. Now it’s the Senate’s turn to pass its own version and it, too, is turning out to be a struggle. 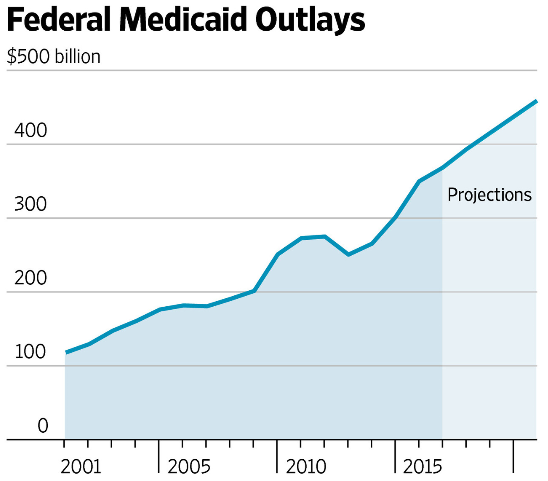 Medicaid is finally put on a budget with annual increases in spending, starting in 2025, tied to the overall rate of inflation. In return, states will gain substantial latitude to use funds more effectively and efficiently. Tax Credits in the Senate bill are means adjusted and will also encourage younger people to enroll for coverage. This is an improvement over the AHCA. Expanded coverage. Mr. Roy predicts that passage of the Senate bill would increase (not decrease as the CBO predicts) the number of Americans with health insurance five years from now. This will result because the near poor in states like Texas and Florida, which have not expanded Medicaid, will be eligible for the new means-tested tax credits. The 10th Amendment is strengthened because so much more authority for regulating healthcare insurance is transferred to the states. This represents huge progress because states are so much more fiscally responsible than the federal government (they have to balance their budgets)! Conclusion. 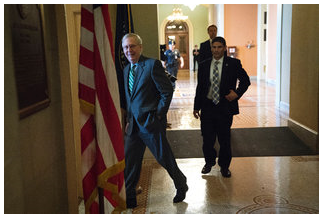 There are certainly many imperfections in the Senate bill. It does nothing to limit tax credits for employer-sponsored insurance. This is sorely needed to put the overall cost of American healthcare on a sustainable course. It does nothing to help low income people who struggle with high deductibles (for example, by helping to set up Health Savings Accounts). It also does nothing to rein in the cost of Medicare, such as by introducing means adjusted premiums and allowing Medicare to negotiate lower drug prices. Nevertheless it is a huge step forward in controlling excessive healthcare costs as well as expanding health insurance coverage to more Americans in a fiscally responsible way. So declared Douglas Holtz-Eakin, former director of the Congressional Budget Office, in March 2011. 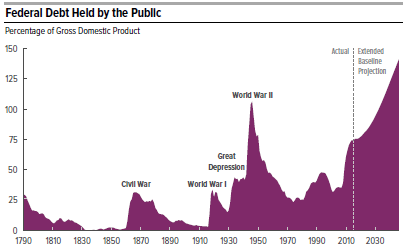 At the time, federal debt held by the public (on which we pay interest) stood at 63% of GDP. Now, just six years later, that ratio stands at 77% and is projected by the CBO to reach 150% by 2047 if current laws remain unchanged. The interest rate on federal debt has averaged 5.8% over the past 60 years. 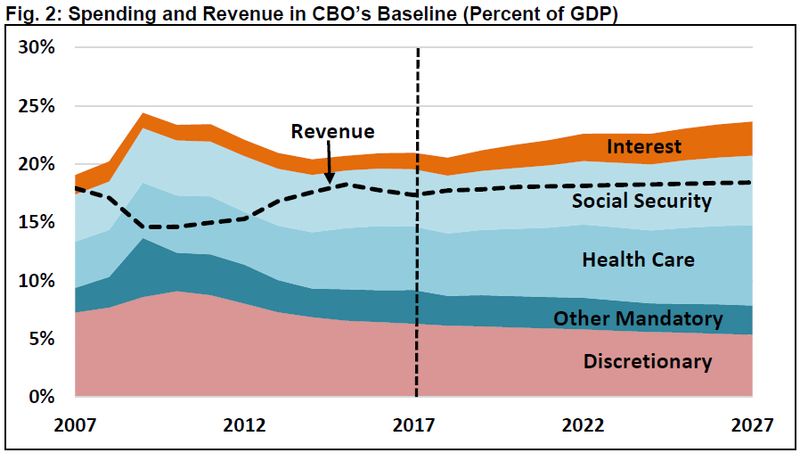 It is now at an unusually low 2% and the CBO projects that it will climb no higher than 4.4% by 2047. Even with such a conservative projection, the total cost of servicing the debt will rise to almost 1/3 of federal revenue by 2047, compared with just 8% today. Reduces national savings and income in the long term because more of people’s savings would be used to buy Treasury securities, thus crowding out private investment. Increases the government’s interest costs and thus makes it much more difficult to lower deficits. Reduces the ability to respond to unforeseen events. For example, when the Financial Crisis hit in 2008, public debt stood at 40% of GDP and lawmakers had the flexibility to respond to the crisis with both TARP and a fiscal stimulus. Such costly actions will be much more difficult next time. Increases the chances of a new fiscal crisis if investors become less willing to finance more federal borrowing or demand higher interest rates in return. Conclusion. The more debt that accumulates and the higher interest rates rise, the more painful it will become to implement a solution. What is really scary is that nothing will be done until a new crisis occurs. Then we will be forced to act and it will be very painful indeed.